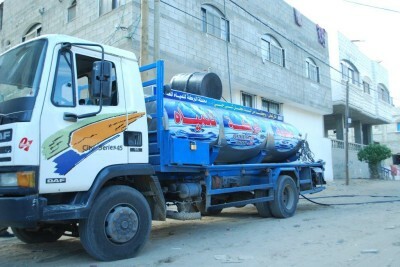 On Christmas Day 2013, a small armada of tank trucks drove around Jabaliya, the largest refugee camp in the Gaza Strip and one of the areas severely affected during the recent floods. Clean water is in short supply here, and many households are forced to spend more than a quarter of their disposable income on this coveted resource. In a refugee camp marked by poverty, this cost is even higher than it sounds. So the truck made frequent stops to fill the water tanks on rooftops, in stairwells or in shacks of corrugated iron and tarpaulins, since the water, this time, was free. The news of free water spread like wildfire in the camp, and people began to gather around the cars with jugs they wanted to fill, some as small as five liters. 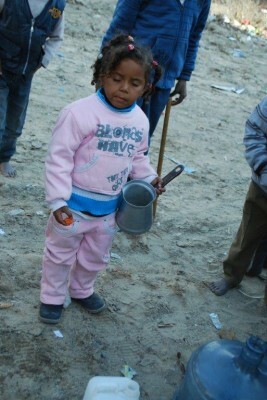 A little girl with pigtails came with a coffeepot. Others pointed to houses a few blocks away, afraid that the water would run out before the cars reached them. But the water would suffice. 2.3 million liters were distributed over a period of five weeks in a well-coordinated program. The initiators are an Irish couple, Derek and Jenny Graham, and the program was funded by the Perdana Global Peace Foundation. This was not the first time the Grahams had taken the initiative to coordinate a similar program. In 2012, they worked for three months handing out water, all over the Gaza Strip that time in green-colored bottles. 600,000 1.5 liter bottles, purchased from an international soft drink giant’s Gaza plant, were carried into mosques and churches for further distribution to hospitals and schools, but also handed directly from the cars to the outstretched hands in the areas most affected by poverty. On Fridays, during the weekends here, the drivers also worked for free, contributing in this way to distribute water to more people in need. Water distribution is not the only thing the Grahams do. On Christmas Evem they were in a Bedouin camp in the north with blankets and plastic sheeting they had purchased using funds raised on their Web site, separate from Perdana. Because of the simple homes the Bedouins had built, they were hit very hit by the storms that recently swept across the Gaza Strip and in dire need of help. Not only was there major damage to their homes and cattle-sheds, but most of their crops were beyond rescue. But they fell through the cracks if they were not refugees, and were therefore not supported by the UN refugee agency, UNRWA. The government’s ability and willingness to invest in infrastructure near the buffer zone near the separation barrier between Israel and the Gaza Strip, facing constant shootings and incursions by the occupying power, is limited. The Grahams’ solidarity with the Palestinian people in Gaza did not start here. In 2008, Derek was on the Free Gaza and Liberty boats when they broke the siege, even if only temporarily. Later that year, he sailed on the Dignity which was boarded by the Israeli military, resulting in a short detention. 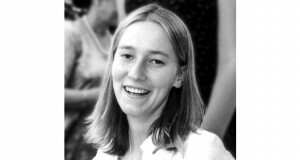 More attempts followed, on Humanity in 2009, and with Jenny on the Rachel Corrie and Challenger I and II in 2010. In 2011, they made an effort with the MV Finch, but were forced away, and into Egyptian waters, by the Israeli military about 400 meters from their goal. A three-week detention on board the boat, docked in al- Arish, followed. According to Israeli terminology, they are probably classified as repeat offenders. That they tried to bring medicine to a health care system desperately in need because of the blockade, as well as cement for reconstruction, is not likely to be seen as a mitigating factor. The cargo the MV Finch carried, a total of 7.5 kilometers of PVC sewer pipe, finally entered Gaza, with help from the UN, after an eight-month battle. 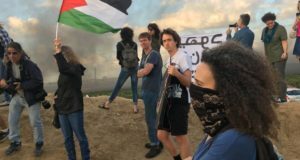 Their work for the Palestinian people has resulted in an impressive network of contacts with influential people at multiple levels within the community, necessary contacts for the plans they are making for the future. Recently they received approval from the port authority and support among fishermen for an experiment to significantly reduce fuel consumption relative to the catch, something important when fuel prices have doubled since Egypt demolished the tunnels, and with catches gradually decreasing already due to Israeli military limits on fishermen’s ability to pursue their profession. Among their plans is also a sea rescue unit, an effort that is already underway and a project that finds legitimacy in the fourth Geneva Convention. But what is it that compels them to do all this? They are now in their sixth year, starting from when they first entered by sea. They do not seek fame, and the compensation they receive from Perdana is only paid when they perform projects on its behalf. And why Gaza? Jenny looks up from her laptop when I ask the question, shrugs, and explains for me the similarities between the Palestinian situation and the Irish people’s suffering during the British occupation: the arbitrary arrests, the denials of human rights, and the desire for freedom and self-determination that cannot be extinguished even by force of arms. They have no trouble identifying their history with the Palestinians, and it feels completely natural to assist them. 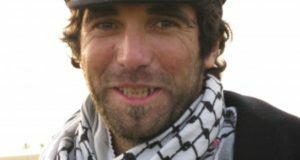 Derek nods in agreement, adding that they cannot reach the West Bank after their time in Israeli detention, and the Gaza Strip is the only part of Palestine where they can reach and work. There are moments when we wonder how long we will cope, he tells me, but when we see that our efforts are making a difference, it is easier to continue.